It’s always an exciting day when a UNESCO site is on the docket, and today’s one of those days. 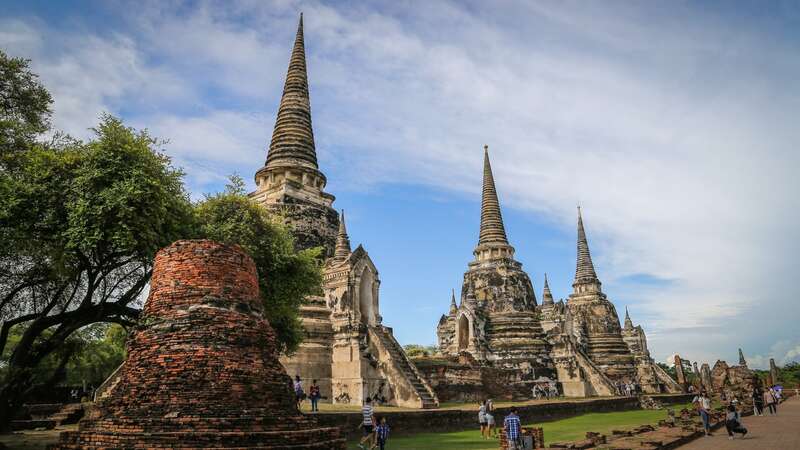 It seems that most visitors to Bangkok join a tour group to visit the ancient city of Ayutthaya, which is located about 80km (50mi) north of the city. I’m not a big fan of tour groups—even more so now that we have a baby, who really doesn’t give a flying flip about tour group schedules. 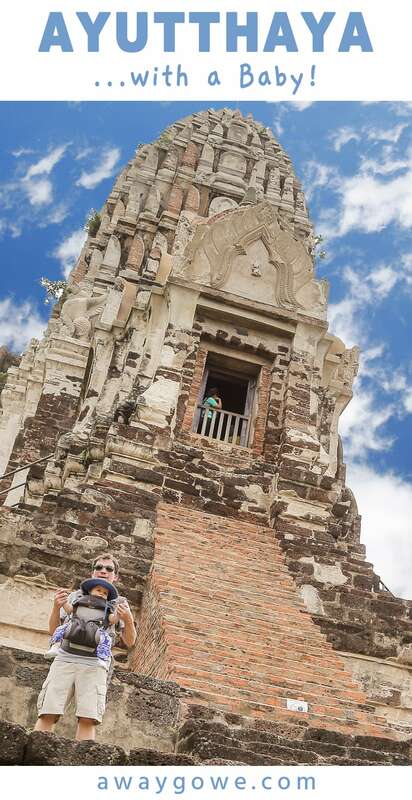 Fortunately, with a little effort, a day trip from Bangkok to Ayutthaya can easily be done independently, as long as you’re flexible and prepared for a little bit of adventure—but I’d imagine you wouldn’t have otherwise found yourself in Bangkok with a wee one if that weren’t the case, right? There are a handful of ways you can get between the two cities quickly and efficiently. 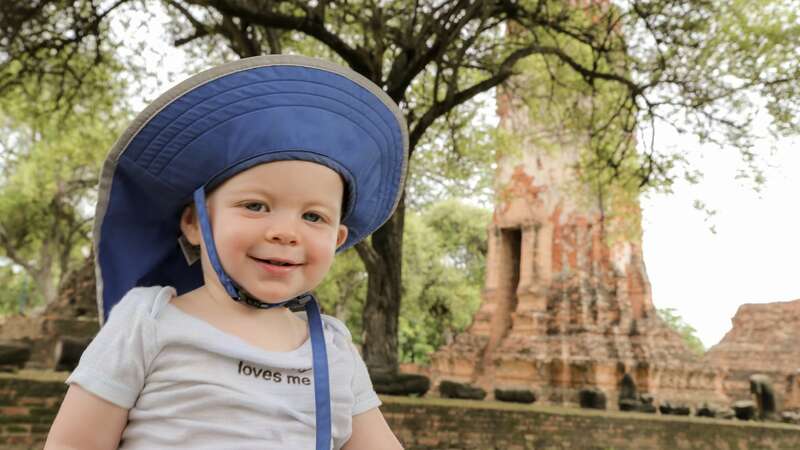 We personally think the train is the best way to get to Ayutthaya, particularly if you are traveling with a baby. However, there are a variety of other options (more on taking the train below). Of course, if you have your own car (or a rental), you can drive. If this is you (…you lucky devil…), save yourself some time and skip to the next section. You could also hire a taxi to take you, which can be hired all around town. 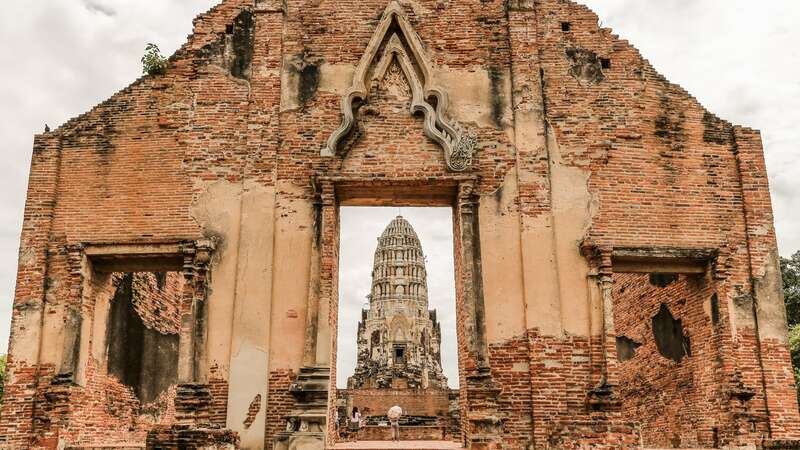 Be forewarned, that if you’re planning on staying the night in Ayutthaya or only taking the taxi one way, you may be hard pressed to find one willing to make the trip—and many will straight up drive off the second you say the word Ayutthaya. Best to book through your hotel/guesthouse. Honestly though, if you’re keen on going this route, you might as well just opt for the tour group. Ah, yes, bus, minivan, and everything in between. If you are keen on taking the bus/minivan, you can take the BTS sky train to Mo Chit station, then make a five minute transfer (via buses 3, 26, 77, 96, 104, or 509) to Mo Chit Northern Bus Station (alternatively, you can take a taxi from your hotel/guesthouse direct to Mo Chit Northern Bus Station). Buses from the station run every 20-30 minutes, and there’s generally no need to book tickets in advance. Minivans leave when they want to leave, so hop on the first available one you see. With that said, I don’t generally recommend inter-city minivans in Thailand for safety reasons (and comfort reasons with baby—ever had to change a poopy diaper on a crowded minivan speeding along at 140kph? Trust me, you don’t want to). Note that because buses and minibuses are subject to the same roads and highways and everyone else, traffic can easily add an hour or two to your round trip. Doing it on our own means we get to work a legitimate train ride into the day. 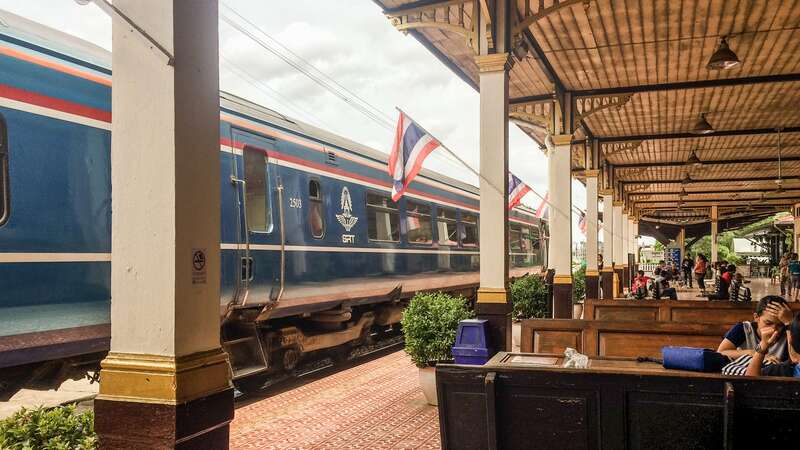 We love train travel, and living in Laos doesn’t afford us opportunities to ride the rails, so we’re pretty excited. We took a taxi-meter from near Khao San Road to the historic Bangkok Railway Station (a.k.a. Hua Lamphong), which cost about US$2.00. Upon entering the station, there were friendly [English-speaking] officials there to direct passengers to the appropriate train. Trains servicing Ayutthaya leave about every hour, but there can be longer gaps, midday. 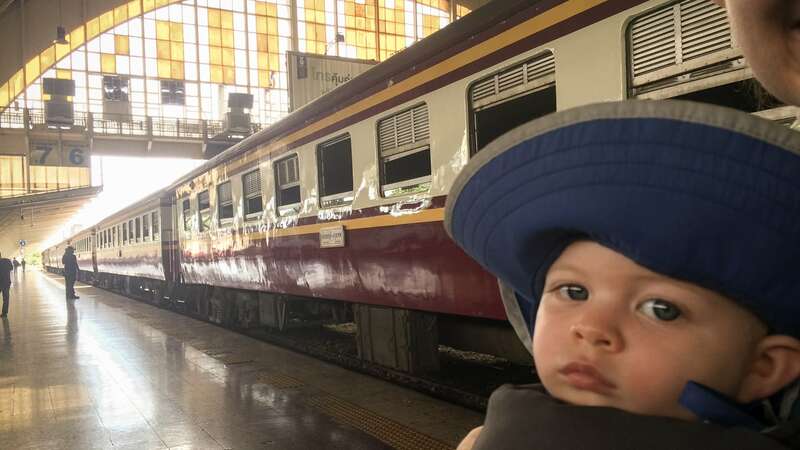 We had just missed the 3rd class regular service train, so our next option was the much more expensive 2nd class A/C Special Express (US$10.00 vs. US$0.50!!!). Still, $10.00 per passenger for a comfortable 90-minute train ride isn’t too bad of a deal. 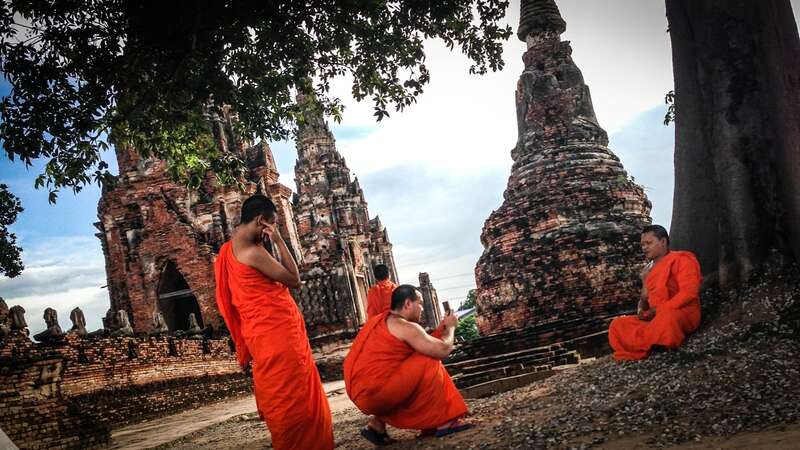 And yes, it took us 90 minutes on an express train to cover the 50 miles to Ayutthaya—most of that time was spent stopping at stations in Bangkok on our way out of the city, but still a great experience! It’s hard to beat the comfort and flexibility of being able to stand up and walk around while under way, particularly with a one year old. And it’s hard to beat the commanding view from the huge windows on most Thai trains. Another benefit of taking the train over the bus is the location of the railway stations in both Bangkok and Ayutthaya. In Bangkok, the station is just outside the tourist zone—a short taxi ride (or walk, depending on where you’re staying and your fitness level) away. 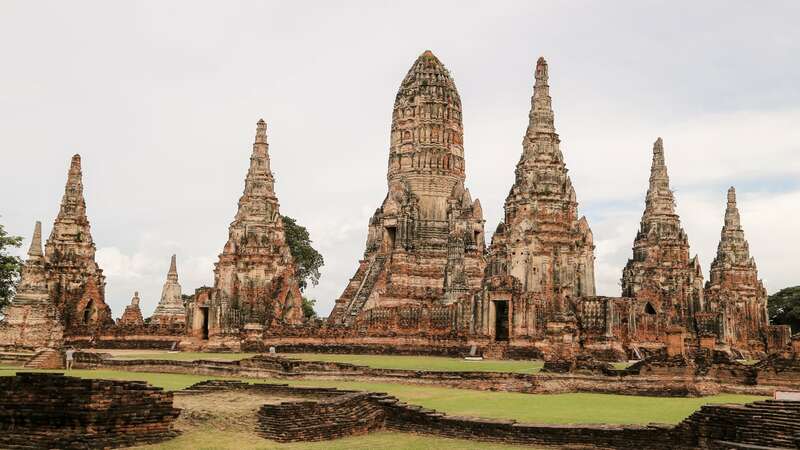 While the rail station in Ayutthaya isn’t within a stone’s throw of the historical park, it is much closer than the main bus station, and certainly within walking distance for someone with an average fitness level. Once at the Ayutthaya railway station, it’s more or less a direct shot west to the nearest major ticket booth. 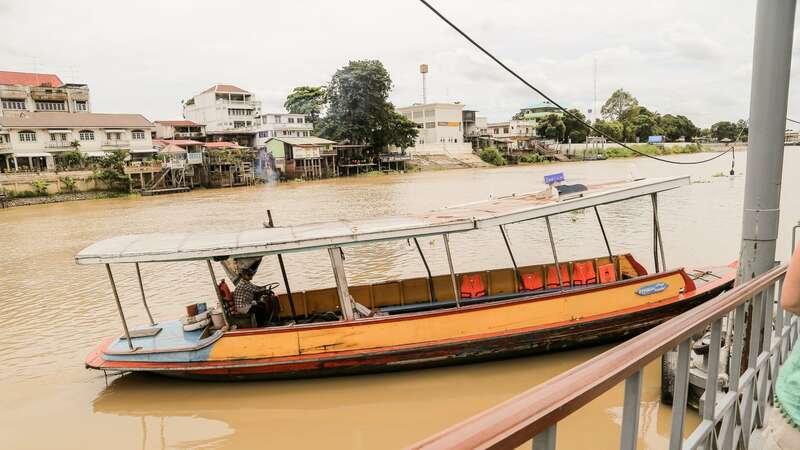 However, there is a small body of water that you must cross by ferry. It’s a short walk to the ferry, though there was a bit of confusion as to the actual location. I’ve included a map in this post to hopefully make it a bit less confusing (see below). From the ferry dock, it’s a leisurely 1 km (0.75 mile) walk straight down the road to the closest major site on the island, Wat Maha That. 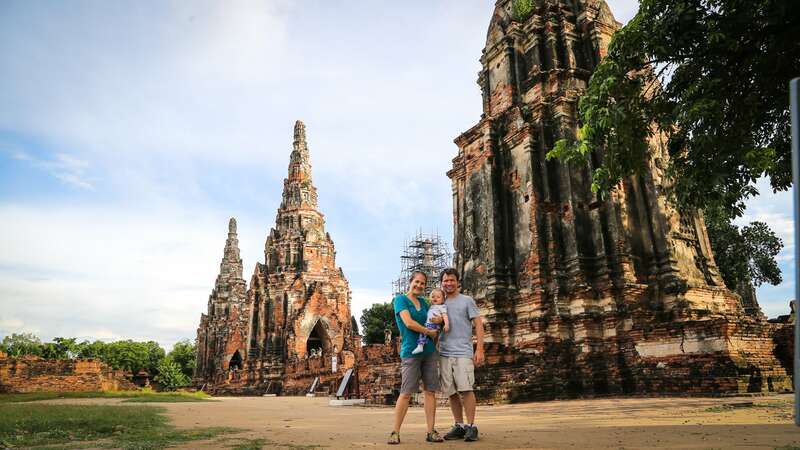 In addition to the main archaeological complex and satellite sites, Ayutthaya is a living, breathing town of 50,000 people, with a slew of tourist-oriented amenities and facilities. Some people choose to stay overnight in town, and if you are a UNESCO fanatic, want to fold in a trip to Kanchanaburi to the north, or have time on your side and want to take it slow, I definitely recommend going this route, particularly if you have a little one (or multiple) in tow. Getting around is fairly easy and straight-forward, particularly with a decent map. 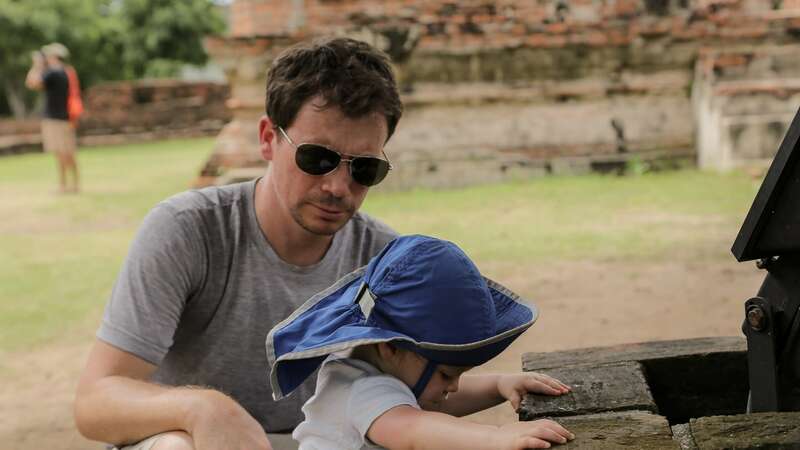 You can certainly walk the main historical park on the “island,” but if you want to see some of the satellite sites (some I’d highly recommend), you’ll want to grab a tuk-tuk. You can get around in any number of funky tuk-tuks that hang out outside of the railway station and around all the major historic sites. As a side note, we find it easiest to wear our son in a front-loading carrier when hopping on and off of tuk-tuks, for safety, comfort, and ease. We’ve had excellent results with our carrier from three months of age (with insert) up through the present. We’ve included a map (below) with helpful markers that we wish we would have had easy access to (including the ferry docks, seven main sites that are included in the day pass (green markers), the restaurant zone, and other points of interest. 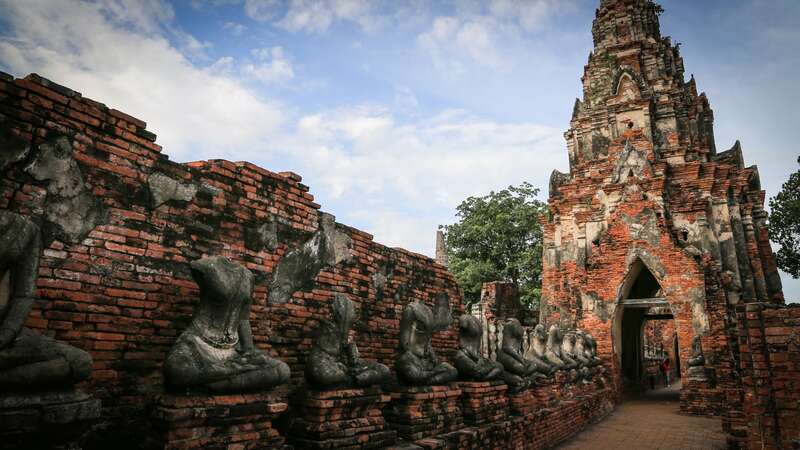 What Makes Ayutthaya So Historically Significant? 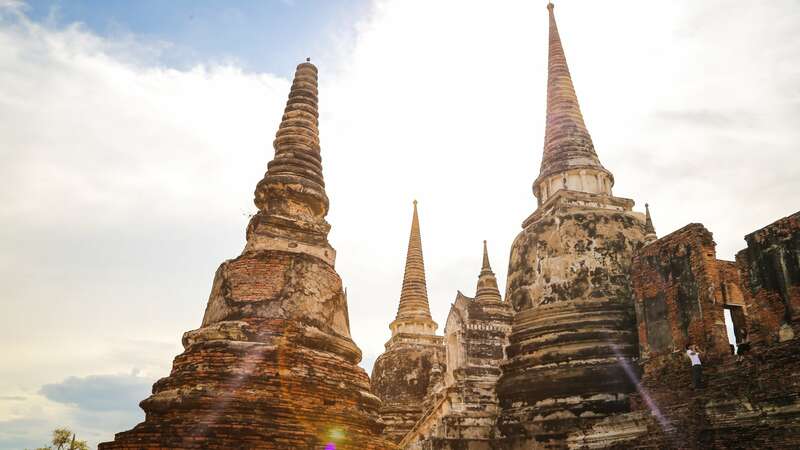 The city was founded by King Ramathibodi I in 1351 and served as the seat of the powerful Ayutthaya kingdom until it was destroyed by the Burmese Army in 1767. 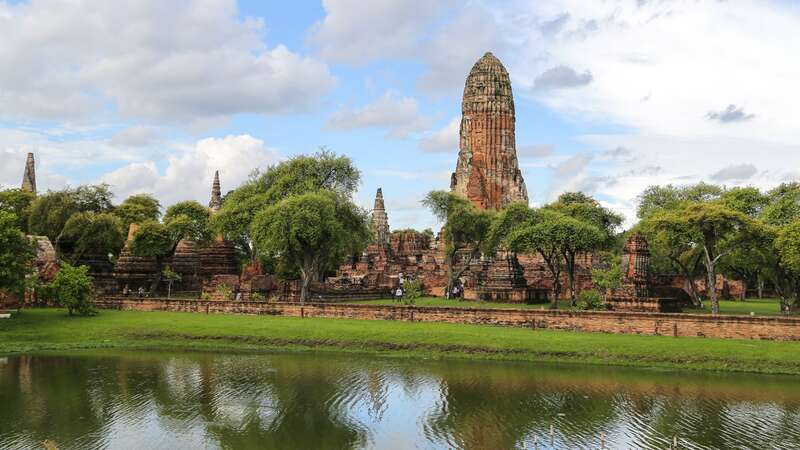 Known as Siam to the Western world (though subjects identified themselves as Tai), Ayutthaya was one of the biggest and wealthiest cities in the East at the height of its influence, and its size and wealth were often compared to that of Paris in the 17th century. Walking around some of the more major sites, one can get some sense of what it might have been like to roam this vast city. With so many fascinating structures it’s also easy to forget that these are but a fraction of what was here in the golden age of the ancient city. Ayutthaya Historical Park became a UNESCO World Heritage Site in 1991. Our first stop of the day was Wat Maha That, the site of perhaps Ayutthaya’s most photographed image: the sandstone Buddha head mysteriously tangled in tree roots. Apparently, in the wake of sacking the city, the Burmese toppled a Buddha statue perched above this wall. 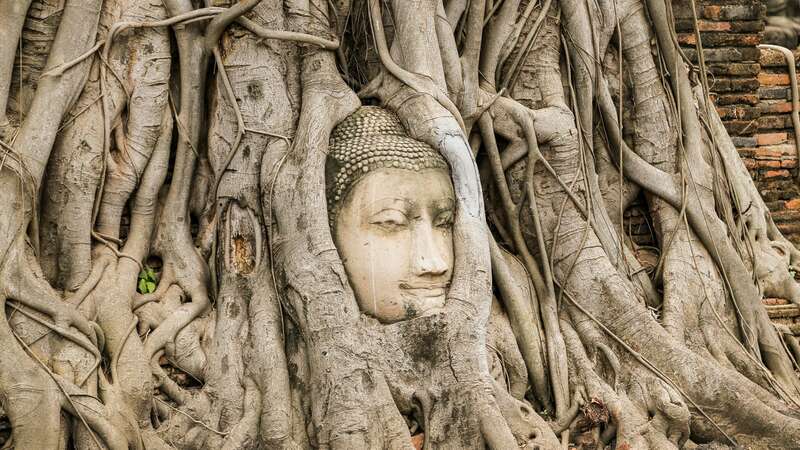 The head remained undisturbed for centuries as the roots of this tree slowly grew around the Buddha head. There are numerous ancient structures in the historical park (too many to count). Many are off limits for climbing, but some are not. Wat Ratcha Burana is one of the few that you can actually climb into, and if you’re brave, you can descend a dark and steep set up steps into the bowels of one of the more prominent structures. But perhaps the most impressive (and most photogenic) of all the temple sites is Wat Phra Si Sanphet (Temple of the Holy, Splendid Omniscient), largely characterized by three imposing and stunningly preserved stupas. Sanphet was the holiest and nearest temple to the royal palace and served as a model for Bangkok’s Wat Phra Kaeo on the current Grand Palace grounds. 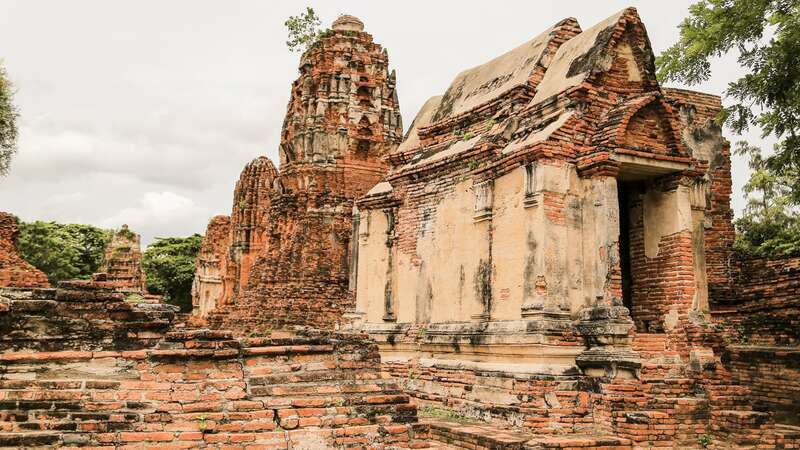 Located southwest of the main cluster of archeological sites, just across the river, is Wat Chai Watthanaram, which despite its removed location is definitely worth a visit, and easily accessible by tuk-tuk. This Khmer-style complex is unique among the ruins of the historic park and is often compared to various sites in the more widely known Angkor complex in Cambodia. There are three main areas to grab food (ranging from reliable to excellent) after a long day exploring the historical park. There are numerous eateries located along the south side of the “island” along U Thong Road. Baan Kao Nhom in the east and Sala Ayutthaya in the west are good bets. Starting at Wat Mahathat and moving north along Chikun Road is another pocket of good restaurants. Check out Somtum Sukunya and Busaba Cafe. There are also a handful of good restaurants at the ferry dock on both sides of the river near the train station. Raan Tha Luang on the west bank, and the Seven Seas Restaurant next to the station are highly recommended. While there are many worthwhile local eateries across the tourist zone, it didn’t appeal to us to take a shot in the dark in the heat of the day with Noe’s nap time looming. Passports (we didn’t need them to purchase our rail tickets, but it’s always good to bring them just in case, stowed securely, of course). A stroller! 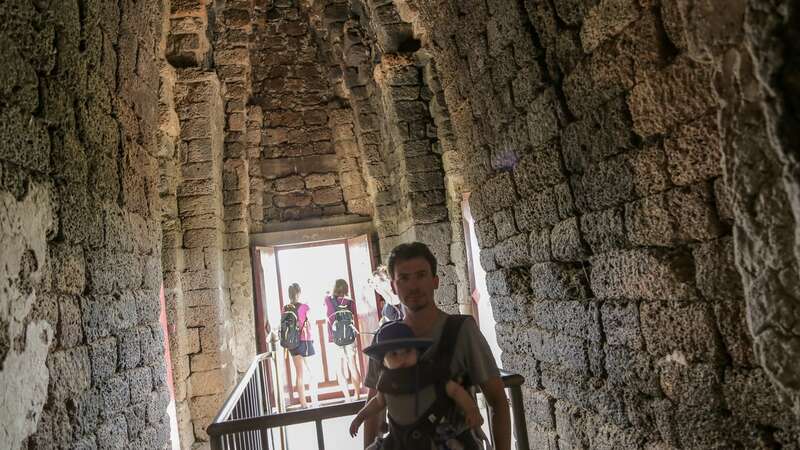 The historical park is one big uneven archeological site with a few busy roads interspersed. 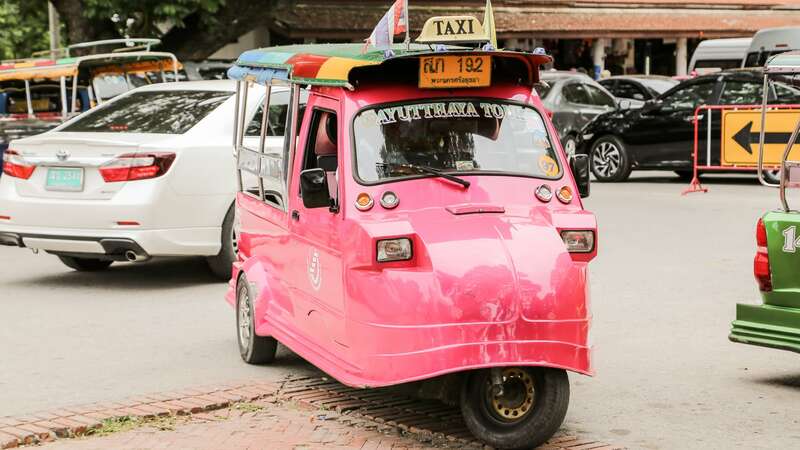 Plus, if you want the flexibility of hopping on/off tuk-tuks a stroller may quickly become more of a burden than a bonus. Clothes that are too warm or take too long to dry. It’s generally pretty hot and humid in these parts, rainstorms can happen throughout the year.